To all my writer friends out there I issue a challenge. Try something outside of your creative box this month. What does that mean? In my case, it was Painting With a Twist. Yes I know exactly what you’re thinking, “But teschoenborn, I barely have time to write, how am I supposed to do something else creative?” Trust me, those thoughts and guilty feelings flooded through me as well. But I decided a few hours of my time was a small price to pay for a creative recharge. Okay, so what is Painting With a Twist? It’s a company specializing in a fun painting experience. You show up with your snacks and wine, yes I said wine, where an instructor walks you through a predetermined painting, step by step, no previous experience required. 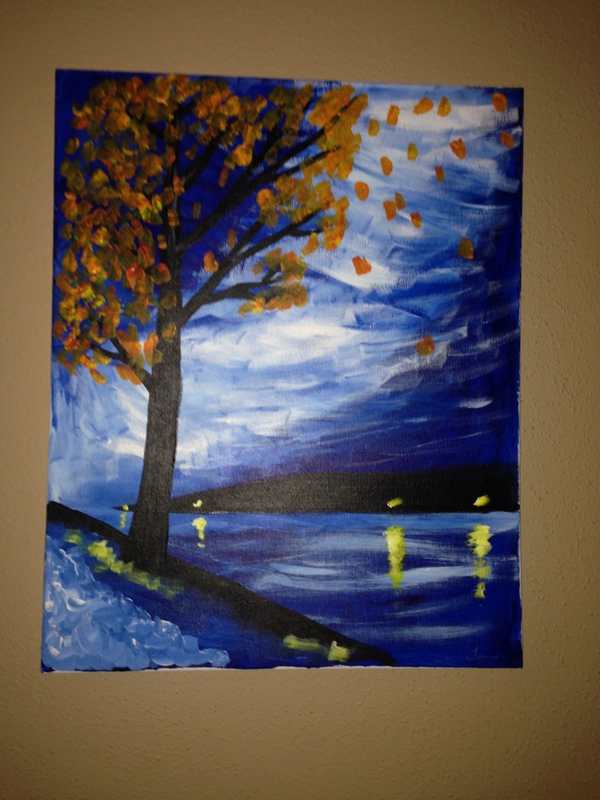 Thank God, because this was my first painting experience. The instructor was wonderful, the atmosphere relaxing yet fun, and I left feeling satisfied as well as recharged. Oh, and the bonus? I took home a painting to hang on my wall!